Christmas has long been a time associated with receiving ghostly and spectral visitations. Dickens’ Christmas Carol is the most famous example, with Scrooge haunted by the ghost of his former business partner Marley and a series of Christmas spirits. The Cambridge academic (and medieval historian) MR James wrote his wonderful ghost stories to tell in his candle-lit King’s College digs on Christmas Eve in the early twentieth century. But even in the Middle Ages the depths of winter, particularly the ‘Twelve Days of Christmas’ between 25th December and 5th January, was a time when the souls of the dead might return to earth, particularly if they had business they needed to settle before their souls could rest . These visits were not necessarily ‘spooky’, but could, as this example witnessed by some twelfth century monks of Durham, could be uplifting and joyful. St Cuthbert died in 687, but nearly 500 years later he paid a special Christmas morning visit to one of his monks on the tiny Northumbrian island of Inner Farne. Cuthbert had lived as a hermit on Farne for many years and the island was a place of pilgrimage, particularly for sailors who had been saved from shipwreck through their prayers to Cuthbert. Durham Cathedral maintained a handful of monks in buildings on Farne as a monastic retreat and to cater to the small numbers of hardy pilgrims who took the boat to the island. No date is given for the following miraculous vision, recorded in the 1160s by Reginald, a monk of Durham, although he claimed to have heard it from one of the brothers involved. Two monks of Durham looked after the small chapel on Farne, where St Cuthbert had been a hermit. On Christmas Eve they stayed in prayer until midnight when they celebrated the Mass. After this one of them went off to get some sleep while the other remained to pray in the church. Suddenly, he saw lights glimmering at the door of the church, and the closed doors both opened. He saw two monks enter with lighted torches along with an old man dressed as a bishop, and they went through the church to the High Altar. There they performed the Christmas Day Mass, and sang ‘A child is born to us’ to the sweetest music. Candles shone on both sides of the altar, and when the bishop began to sing ‘Gloria in excelsis Deo’ a great number of angels sang on high. The brother watching this tried to get up but felt as though he was being pressed down by a great weight and could not move. The bishop continued through all the Mass, and at the end gave a blessing to all people and clergy. The bishop and the monks then left the church as they had entered. The brother recognised the bishop as St Cuthbert, even though he had not been able to see his face by candlelight, as he had often called on his mercy and poured out vows to him from the depths of his heart. Also he knew that it must have been the spirit of St Cuthbert because he had done so many great works there in his life, which would have been celebrated in heaven. After Cuthbert and the monks had left the brother felt his body lighten and his soul filled with cheer. He went and woke his sleeping companion, who told him that they should sing the Christmas Mass. 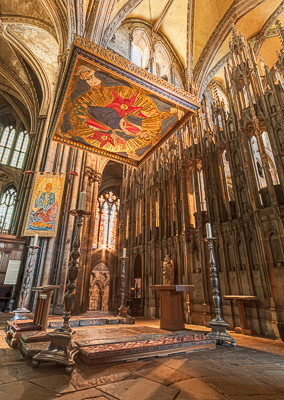 However, the brother who had witnessed the vision refused to do this, as it was not permitted that he could celebrate Mass on the altar on the same day as a bishop, and explained his vision of St Cuthbert. Then both of them dissolved into tears of joy, and leapt about that such a vision had been granted . Lest we believe that Cuthbert’s Christmas mission was to spread joy through all hearts, we should consider a story told by Bede. Cuthbert was in his hermitage on Farne, engaged in solitary prayer on Christmas Day, when some of the monks of Lindisfarne came and asked him to join in their celebrations and feast. He agreed to their requests and they sat down to Christmas dinner. Halfway through the meal, he admonished the monks for indulging themselves in merriment, eating, and conversation rather than in prayer and watchfulness. The monks pointed out that they had spent a long time in prayer and fasting, but that Christmas Day was a feast day for joyful celebration. After repeating his warnings a second and a third time as the meal went on, and particularly emphasising the dangers of temptation, eventually the monks ceased to be so jolly. Yet the damage had clearly already been done, as when they returned to Lindisfarne the next day one of the brothers was dead of plague, and through the year most of the monks who had been so happy on Christmas Day were wiped out by the disease. Doubtless, Cuthbert notes, this was a divine punishment .